Tag Archive | "MYWA tournament"
Cedar Springs youth brought home 21 medals from Kentwood. Courtesy photo. Cedar Springs Youth Wrestling Club joined 67 teams at the first MYWA tournament of the season at Kentwood HS. 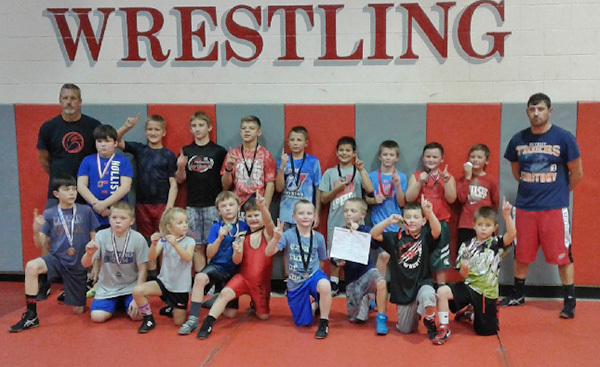 464 wrestlers from all over the state competed for top spots in five age groups. We brought 28 wrestlers who fought through 83 grueling matches to bring home 21 medals. They finished the day 43W-45L. Out of the top 100 wrestlers, Carter Falan was 28th in fastest pins in the shortest amount of time with 3 in 6:34. Jayden Mull was 63rd with 2 in 1:43. Conner Dines was 89th with 2 in 4:20. Tucker Dines had the 7th fastest Tech time in 2:20; Taylor Crystal (8th) with 2:25; Maston Wood (11th) with 2:33; Ben Brunner (15th) with 3:00. Maston Wood (6th) had the fastest pin for the team with :14; Hudson Crystal (12th) with :16; Zachary Vu (28th) with :22; Jayden Mull (31st) with :23; Conner Dines (73rd) with :37; and Jaxon Fitzgerald (78th) with :38. Scoring the most team points were Tucker Crystal (27th) with 20; Carter Falan (50th) with 18; Hudson Crystal (64th) with 17; Tucker Dines (96th) with 14.5; and Conner Dines (98th) with 14. Scoring the most single match points were Jayden Mull (5th) with 18; Taylor Crystal (5th) and Maston Wood (5th) each with 17; Tucker Dines (19th) with 16; Ben Brunner (36th), Taylor Crystal (36th) and Carter Falan (36th) all with 15; Hudson Crystal (53rd) with 14; Gabe Gair (64th) with 13; and Alex Ream (79th) with 12. Scoring the most total match points were Taylor Crystal (7th) with 42; Tucker Dines (20th) with 34; Jayden Mull (22nd) with 33; Carter Falan (28th) with 30; Thomas Prins (78th) with 21; and Gabe Gair (87th), Alex Ream (87th) and Ben Streeter (87th) all with 20. CSYWC finished 3rd in most pins with 18 in 30:53,; first in Techs with 4 in 10:18; first in match points with 392. In the 2011-2013 division, 46lb class Taylor Crystal placed 4th after 4 matches. In the 61lb class Jaxon Fitzgerald placed 1st after 2 matches. In the 67lb class Ben Streeter placed 2nd after 3 matches. In the 2009-2010 division, 52lb Novice, Tucker Dines placed 3rd after 4 matches. In the 58lb Novice class, Jayden Mull placed 2nd after 4 matches. In the Open class, Tucker Crystal placed 1st after 3 matches. In the 64lb Open class, Chasyn Winchel placed 3rd after 3 matches. In the 67lb Novice class, Tanner Wood placed 3rd after 2 matches. In the combined 77/82lb Open class, Jonathan Libera placed 3rd after 2 matches. In the 97lb Novice class, Zachary Vu placed 3rd after 3 matches. In the 2007-2008 division, 75lb Novice, Conner Dines, placed 2nd after 3 matches. In the 90lb Open class, Hudson Crystal placed 2nd after 4 matches. In the 110lb class, Novice Thomas Prins placed 2nd after 4 matches. In the combined 130/150lb Open class, Dakota Winchel placed 3rd after 2 matches. In the 2005-06 division, 75lb Novice class, Jack Sherburn placed 3rd after 2 matches. In the 112lb Open class, Gabe Gair placed 4th after 4 matches. In the 2003-04 Open division, 114lb class, Carter Falan placed 2nd after 5 matches. In the 122lb class, Logan Troupe placed 3rd after 5 matches. In the 138lb class, Alex Ream placed 1st after 2 matches. In the 170lb class, Maston Wood placed 2nd after 3 matches.